Moms and dads all over know the toothbrushing battle. Whether morning or night, it can be tough to get kids to brush their teeth, even if we are doing the brushing. One way to make it a little easier is to get a toothpaste that is not only effective but one that kids will like. And while it might be tempting just to pick up the bubblegum flavor of any ole brand, not all toothpaste are created equally. We have put together a list of the best toothpaste for kids that will not only keep kid’s mouths healthy but that your kids won’t mind using. But before we get to the list, let’s take a look at a few things including when to start brushing your kid’s teeth, how much toothpaste you should use and more. Getting children into the habit early of having their teeth brushed can help make it easier for older children to learn and maintain a consistent tooth brushing routine. Many dentists recommend that you start “brushing” your infant’s teeth as they appear. Simply wrap a damp washcloth around your finger and wipe their teeth to remove any food. By the time they have at least 4 or more teeth you can switch to an infant-specific toothbrush that has soft bristles. Some dentists suggest that you can start using a fluoride toothpaste (using about the size of a grain) as soon as the first tooth appears, but check with your dentist to see what he or she recommends. When your child turns 3, you can start introducing toothpaste. Look for something that contains fluoride and only use a pea-sized amount of toothpaste. Regardless of age, make sure that children brush twice a day, morning and night. Fluoride toothpaste is considered safe for children and is strongly suggested for most children, but especially those prone to tooth decay. In general, though, the ADA (American Dental Association) recommends that all children use toothpaste with fluoride. However, there are many parents that do not want fluoride in their child’s toothpaste, especially if a child is unable to spit out the toothpaste. While ingesting small doses of fluoride is nothing to worry about, ingesting too much fluoride can be a bad thing. Whether you choose fluoride or fluoride-free toothpaste, there is no doubt that brushing is good for your child’s oral health. If you are still not sure whether you want to choose a fluoride toothpaste, talk with child’s dentist. Xylitol has become a popular ingredient in toothpaste as well as other products such as gum, mints, and vitamins. And it’s not just used just use for its sweetness either. Xylitol is a natural substance found in plants, vegetables, and fruits. It is added to toothpaste, gum, and mints because some research has found that xylitol can help prevent cavities by reducing the number of bacteria that grow in the mouth. More research is needed, by xylitol is considered generally safe with minimal side effects. *Note: Xylitol is very toxic to dogs. If your dog ingests toothpaste that contains xylitol, call your veterinarian immediately. Despite your best efforts, getting kids to brush their teeth can be difficult. Here are a few tips that will help get them to consistently brush their teeth. Use a timer, song or toothbrushing app to keep things fun. There are plenty of toothbrushing apps out there that allow kids to follow along and time them so that they are brushing for two whole minutes. If you can, brush your teeth with them. It’s no surprise that children learn by example. While you might be faithful at brushing your teeth morning and night, let your children see this and if at all possible, try and brush your teeth with them. Let them pick their toothpaste. Whether it’s in the store or online, let them choose their toothpaste, especially the flavor. Even let them try different flavors each time to keep things fun! It may seem like second nature to you, but children need to learn the correct way to brush their teeth. Need a little help teaching them? Check out this video, directed at children, that will help encourage them to brush and teach them why they need to brush in the first place. So now that we’ve covered the ingredients of toothpaste, what to look for and tips to make brushing fun, let’s check out our 10 picks for the best toothpaste for kids! 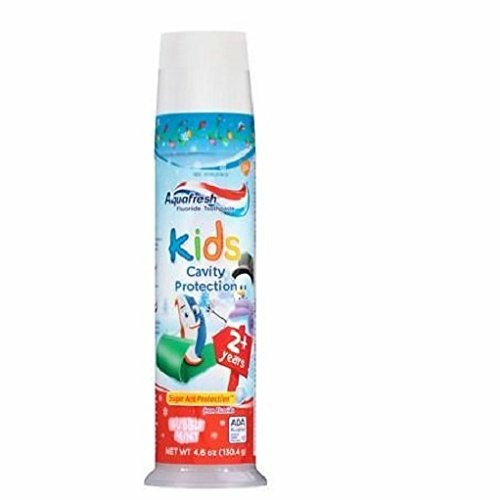 Many of the brands you’ll know (and even use) but there are a few kinds of toothpaste out there that are kid-specific that will help keep things fun and tasty to help encourage healthy happy mouths! Whether you want your child’s teeth as clean and sparkling as a Disney Princess or as tough as an Avenger, Crest Pro Health Stages toothbrush will keep things fun, flavorful and of course, keep kids teeth healthy. Kids enjoy the taste of this toothpaste which of course is half the battle. Flavors options are Bubble Gum and Fruit Burst. 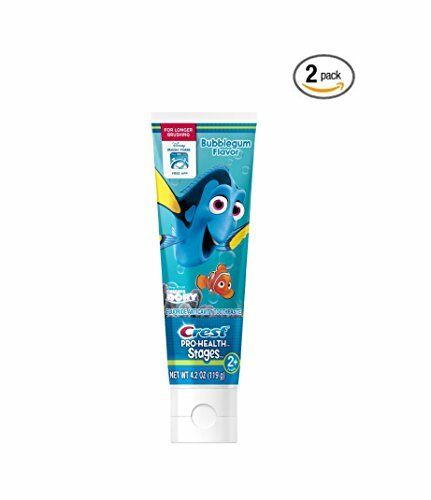 This toothpaste also features your kids’ favorite characters on the bottle including Doc McStuffin, Finding Dory, Disney Princess, Avengers, Cars and more. 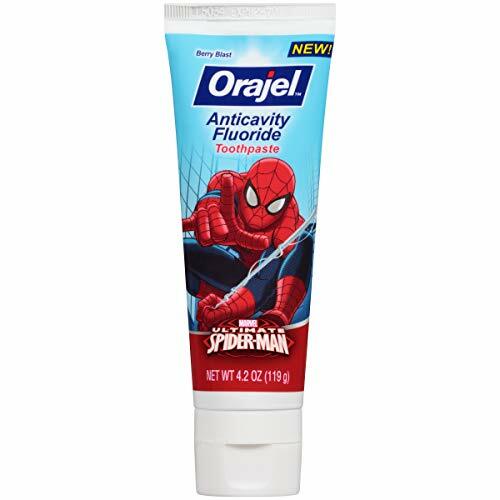 This particular toothpaste contains fluoride is recommended for kids 2 years and older. Kids love the bubble gum and fruit flavor choices. A variety of popular movie and show characters keep kids interested. If you are looking for a fluoride free toothpaste for your little one, this one is it. The strawberry flavor is pleasing and it contains no artificial sweeteners, dyes or flavoring. 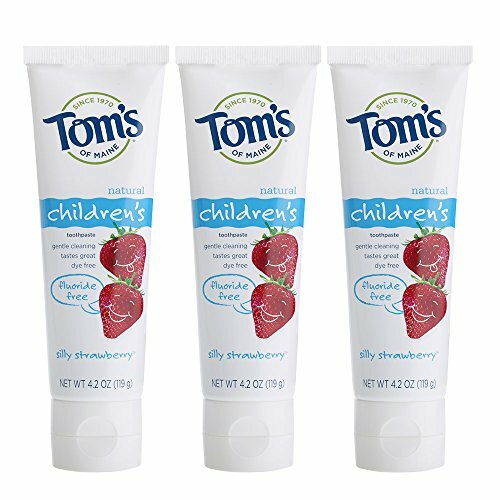 If you are looking for fluoride though, Tom’s of Maine has Silly Strawberry in the anticavity version which contains fluoride. Whichever you choose, your child will be happy with this pick. Comes in fluoride free or fluoride versions. Kids like the strawberry taste. Contains no fake flavoring, sweeteners or coloring. Comes in only one flavor. It’s like toothpaste and mouthwash in one (hence the 2-in-1)! This anticavity toothpaste will appeal to picky brushers who want a variety of flavor choices. 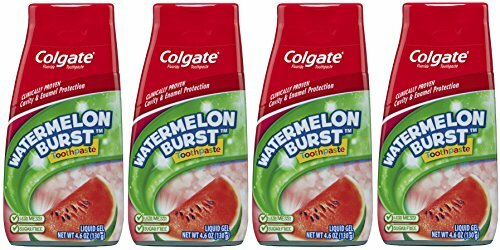 Kids can choose from watermelon burst, strawberry smash, and bubblegum. The unique liquid gel is sugar-free and gentle on your kid’s enamel. The price is low enough you won’t feel guilty buying one of each flavor. The liquid gel can be a bit messy. Here’s another great fluoride free choice! 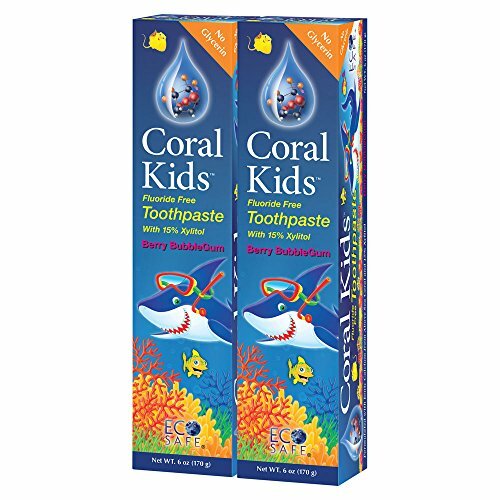 Coral Kids contain Ionic Coral Calcium which is said to remineralize your child’s teeth. 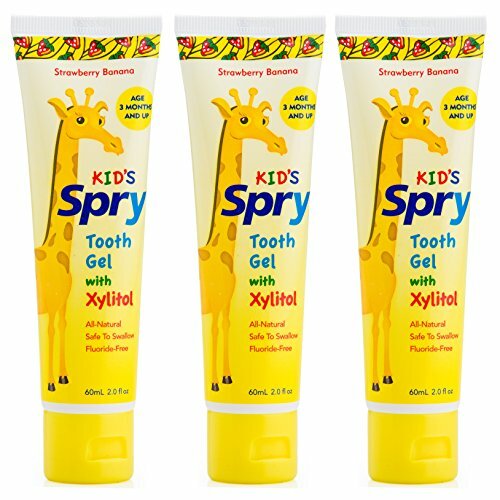 Along with the xylitol and 74 vitamins and minerals, this toothpaste naturally cleans and strengthens kids’ teeth. This toothpaste also contains 4 herbal extracts (Golden Seal Root, Echinacea, Ginkgo, and American Ginseng) which are supposed to help prevent periodontal diseases. It comes in three flavors: bubblegum, mint and tea tree. It is also EcoSafe, meaning no living coral in the ocean was used to make this toothpaste. Instead, it comes from fossilized coral beds that are found above the sea. Natural fluoride-free toothpaste remineralizes teeth. Extra vitamins and minerals help strengthen and protect teeth. A little runny and messy. While bubblegum was a good flavor, the other two (tea tree and mint) weren’t always as loved. If you love Aquafresh, then have your kids try out the Aquafresh Kids Cavity Protection toothpaste. The bubblemint flavor was surprisingly well received. It wasn’t too minty and kids seemed to enjoy the flavor. The only issue is the pump. While the toothpaste itself wasn’t runny or messy, the pump was. Bubblemint taste is well liked. The pump tended to be a little messy. This 100% natural fluoride-free toothpaste contains no gluten, parabens, SLS or any of that artificial stuff and is not tested on animals. But what about the taste? Well, some kids love it. Others hate it. And unfortunately, there’s only one flavor option. Wanted some all natural with fluoride? Kiss My Face has you covered. The Berry Smart Fluoride Free is offered in a Fluoride version as well. Comes in fluoride or fluoride-free options. Need a solid endorsement for your kids’ toothpaste? How about Paw Patrol, Spiderman or My Little Pony? Orajel has you covered. Another hit in the flavor department kids can try Paw Patrol’s Barking Berry or My Little Pony’s Berry Divine. And don’t let the super low price fool you. This toothpaste is effective at keeping cavities away. Kids will like the different characters on the bottle. The berry flavor was popular. Some kids found it too sweet, which yes, it’s possible! Xylitol takes the spotlight with this toothpaste. This toothpaste, or rather tooth gel, is safe enough to use on infants and does a good job keeping kids teeth healthy and clean. It comes in three flavors: original, bubblegum and strawberry banana. The original flavor was said to be pretty sweet, but kids enjoyed it as well as the bubblegum and strawberry banana. Without a foaming agent, spreading the sweet tooth gel on teeth didn’t appeal to older kids. This particular toothpaste also might not be suitable for kids who are prone to cavities. Kids really like the taste. Naturally sweet flavor from xylitol made it appealing for kids. Helped prevent plaque from forming. It doesn’t foam, which kids may or may not like. Might not be effective for cavity-prone kids. This natural toothpaste comes in a variety of tasty all-natural flavors like strawberry, black currant, blueberry, and raspberry. It’s even suitable for kids as young as 6 months. 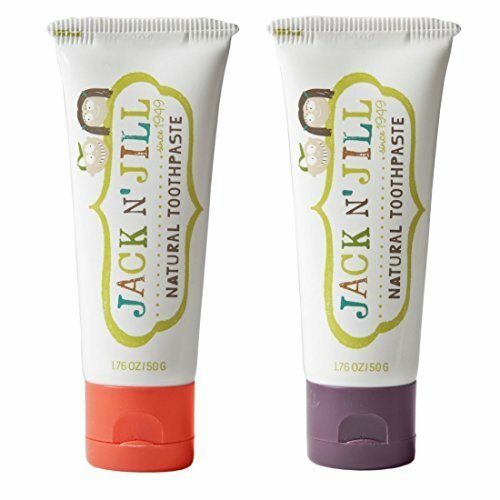 Jack ‘N Jill’s natural toothpaste contains no artificial sweeteners and is naturally sweetened with xylitol. The real fruit flavoring comes from organic fruit. What you won’t get in this toothpaste is any fake coloring, SLS, preservatives or sugar. It is also fluoride free. Safe for infants as young as 6 months. No aritificial ingredients or preservatives. Comes in real fruit flavors. A little pricier than others on this list. 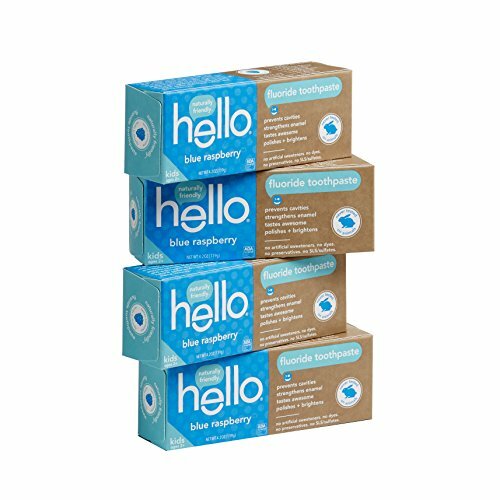 A less well known, but must be included on this list, is the Hello Oral Care toothpaste. This fluoride toothpaste has no dyes or preservatives, SLS or sulfates, gluten, and no artificial sweeteners. The flavors available include blue raspberry, bubblegum, watermelon, and organic apple. It is also vegan and not tested on animals. 4 flavor options to choose from. Not tested on animals and vegan. Free of artificial sweeteners, preservatives, gluten and more. The watermelon flavor wasn’t well liked. Three natural sweeteners make it very sweet. Q: What age should children start brushing their teeth on their own? A: By the time your child is between 6 and 8 years old, you can start to consider having them brush their teeth on their own. Children younger than 6 do not have the coordination or motivation to brush their teeth alone. A: Most toothpaste out there today contains SLS or Sodium Lauryl Sulfate which is a foaming agent. A few of the toothpaste on this list do not contain any SLS. Individuals who are sensitive to SLS while others who are prone to canker sores might want to choose one of the SLS free options on this list. Why make teeth brushing a hassle when you can make it easier for yourself and your child by picking out the tasty effective best toothpaste for kids. Along with the tips we have you earlier, you will have no problem finding a toothpaste right for you. If you are looking for something with fluoride for your little one, definitely try out Crest Pro-Health Stages. They’ll love the tasted and the characters, and you’ll love its effectiveness. But if you are looking for something fluoride-free, the Tom’s of Maine Silly Strawberry appealed to most kids tastes buds and also did its job effectively.